Americans young and old are flunking their finances. A shocking 77 percent live paycheck to paycheck with no savings. And 43 percent of Americans have less than $10,000 saved for retirement, while 49 percent could cover less than one month’s expenses if they lost their income. 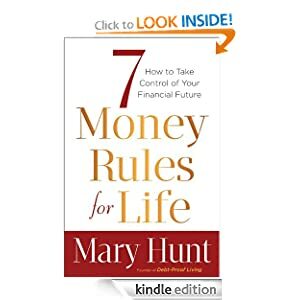 In the face of this bleak financial picture, bestselling author and finance expert Mary Hunt offers 7 Money Rules for Life. This no-nonsense and encouraging book gives readers the keys to get their money under control and get prepared financially for the rest of their lives. In her warm and engaging style, Hunt takes everything that she’s learned over the past twenty years and boils it all down. Presented in a conversational style and readable in a weekend, this book offers applications for each of the seven rules as well as practical advice for how to recover from past financial mistakes. These simple, unchanging, basic rules work in every financial situation, for every income level, and for every stage of life. Money mastery isn’t really that hard. 7 Money Rules for Life can help readers change their futures from uncertain to rock-solid with principles they can apply right away. Mary Hunt is founder and publisher of Debt-Proof Living (formerly Cheapskate Monthly™), which has 35,000 print subscribers and an average of 800,000 website hits per month. Her books have sold more than a million copies, she was the financial columnist for Woman’s Daymagazine, and her daily newspaper column is syndicated through United Features. The author of 7 Money Rules for Life, Hunt speaks widely on personal finance and has appeared on shows such as Good Morning America, Oprah, and Dr. Phil. She and her husband live in California. Also you can download TKWeek for free today only. An all-in-one, planner extravaganza, TKWeek is an in-depth calendar, date book, and week calculator. TKWeek features an impressive array of functional capabilities. Containing the following options, it provides everything you’ll ever need to know about any day in question. The Converting a Date and Week feature finds the week number of a date or vice versa. 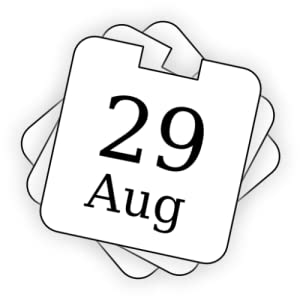 The About a Date feature lists the day of the week, the day of the year, the leap year, and the sign of the zodiac. The Days between Dates and Date Calculator features calculate the number of days, weeks, months and years between any two dates. With the Events Feature, figure out how many days it is until Thanksgiving, Christmas Eve, New Year’s Eve, New Year, Valentine’s Day, April Fools’ Day, International Workers’ Day, Mother’s Day, Bloomsday, Feast of Saints Peter and Paul, Independence Day, Bastille Day, Swiss National Day, Assumption of Mary, German Unity Day, Nationalfeiertag, Halloween, All Saints Day, Shrove Monday, Daylight Savings, Palm Sunday, Easter Sunday, Ascension of Jesus, and the Pentecost. This entry was posted in Kindle Applications, Kindle Apps, Kindle Books, Kindle Daily Deal and tagged 7 Money Rules for Life, Mary Hunt, TKWeek by Paul. Bookmark the permalink.